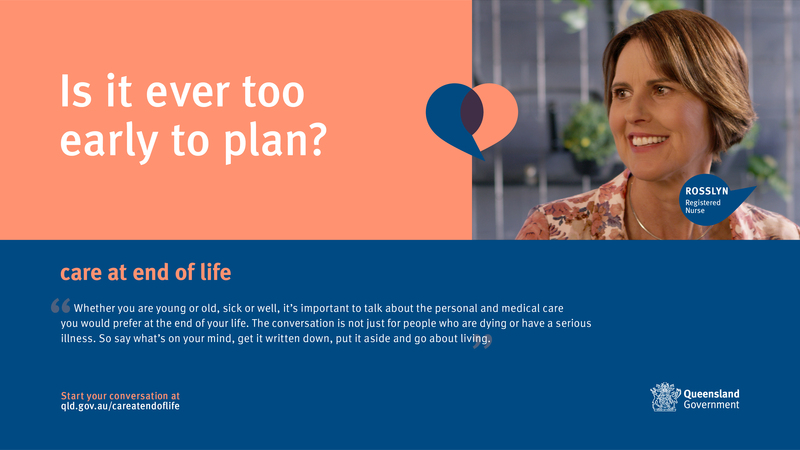 The campaign, Care at end of life, aims to raise awareness about the importance of discussing and planning for care at the end of life. In the next 25 years the number of Australians who die each year will double. In 2014-15, of the 30,000 people who died in Queensland, over half (15,678) died in hospital. Although many people prefer to die at home, the uptake of advance care planning has been slow. Discussing and/or documenting choices for future healthcare maximises the likelihood that personal choices will be respected. Research shows that although 90 per cent of people believe talking about care at the end of life is important, only 27 per cent have actually done so. Common barriers to end of life and advance care planning discussions are a lack of awareness and understanding about care at end of life as well as a lack of knowledge on where to find more information and documentation. 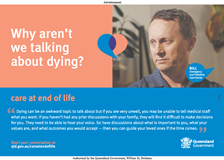 The Care at end of life campaign features real clinicians who are speaking from a professional and personal point of view to assist Queenslanders with building a shared vocabulary about the topic, normalising discussion around death and dying and motivating people to plan their care at the end of life. This may be in a formal or informal way. The campaign includes press, digital and out of home (videos in GP clinics). Supporting stakeholder materials for clinicians as well as consumers have been developed. 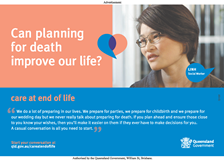 Poster 1: Can planning for death improve our life? Poster 2: Is it ever too early to plan? Pull-up banner 1: Why aren't we talking about dying? Pull-up banner 2: Is it ever too early to plan? Why aren't we talking about dying? Transcript: Why aren't we talking about dying? Voiceover: We're here today to have a conversation about something we can all find a little difficult to talk about. Rosslyn: Why aren't we talking about dying? Sandy: Well I think that it's an awkward conversation. Leyton: Nobody really wants to talk about dying because it might happen to them. Linh: The word dying. That word's very scary for a lot of people. Leyton: You know, it's the elephant in the room that, that nobody really wants to acknowledge. Maria: It has always been associated with a bit of a negative. Rosslyn: We don't like facing our own mortality. Michelle: If we don't talk about it then we don't have to think about it. Bill: We don't like our lives wondering about if we're going to die tomorrow; we live our lives, and we try to live our lives, day to day. Rosslyn: It's going to happen to somebody else, it mightn't happen to us. And of course it will. It's going to happen to all of us. Sandy: So why all of a sudden would you just completely ignore this huge part of your life. Michelle: You know, this is a normal part of our lifespan. We are going to die; how do we want to do that? How are we going to do that well? Bill: If you come to the emergency department there's a risk that you might die if you're very unwell. Often you can't tell us what you want. Leyton: Sometimes I'm choosing that kind of thing along with the family members about "what would this person" ... and I might not be that familiar with the person in front of me. Rosslyn: Advance Care Planning is nothing really special. There's no 'D' on the end of it, so it's not 'advanced'. It's do it now for the future. Do it now in advance. Leyton: When you think about your daily lifestyle, all the decisions you make, imagine doing that for somebody else. Michelle: If you have those conversations prior to any of these things happening to you in your life, then your loved ones are able to help you achieve those things. Leyton: You don't have to cover all scenarios. You don't have to cover in depth medical jargon and all the rest of it. But if you have a talk with somebody about a holistic view, things that you value, that you find important. Then really that's a great big step toward them understanding what you might want. Rosslyn: Well let's think about if it did happen, what would you want to have happen to you? What would you want to tell the doctors and nurses if you had the voice to tell them? Linh: There's so many aspects of it that it's not going to be something that you can have here's... here's the answer. Here's how to do it. Michelle: I call them courageous conversations because people don't want to talk about it. Rosslyn: We all just need to say this... dying is normal. Dying is as natural as birth. It's part of life. Michelle: And it can just be a simple, causal conversation. And that's where it starts. Can planning for death improve our life? Transcript: Can planning for death improve our life? Bill: Can planning for death improve our life? Umm... Absolutely. Leyton: I think it can take away the worry for a lot of people. Bill: We're really not planning for death; actually we're planning for what are we going to do with the time we have left and how do we make it as good as possible. Leyton: I think there's peace of mind for yourself. There's peace of mind for your family members. Umm... and as I said getting better care overall. Bill: I guess the machine that's medicine, they think that they don't have the right to say "No, I don't want that treatment". And as doctor's we find it hard to say "Actually, you don't have to have this treatment if you don't want to". Sandy: It's a relief. Yeah. Linh: The planning isn't about... not just that end of the life, but what would happen the after effects. Michelle: It takes away the grey area. If your wishes are known, then you don't have your loved ones in the background trying to second guess. Maria: We feel at peace, I think, that whatever we have decided on, everybody else is on the same page as us and understands. Rosslyn: You don't have to dwell on it. Say what's on your mind, get it written down, put it aside and go about living. Transcript: Is it ever too early to plan? Michelle: Oop... oop... no glasses. Sandy: Is it ever too early to plan? No. Done. Leyton: Well if you're alive and you... and you...[laughs] and I think that's basically it. Rosslyn: It's never too early to plan for anything but particularly around death because it is the one thing that we are all certain will happen. Bill: Who knows what's going to happen when I'm driving home from this interview. Rosslyn: Having worked with people who have been diagnosed with serious illnesses like cancer, they tell me that it is a bolt out of the blue. That they had no idea that they were going to get this diagnosis and immediately their life changed overnight. Leyton: And it might happen tomorrow, then planning today is the best idea. So I don't think it's ever too early to plan. Rosslyn: I've just asked my... and assisted my 18-year-old son to do an Advance Health Directive. Linh: I have actually completed my Advance Health Directive, and the reason why (and even though I'm quite young) is I know fare well that my parents have a very different opinion to my care than my husband. Bill: It's hard to engage younger people in it because it doesn't seem particularly relevant but I guess it's like superannuation. Who cares about it until you're about to retire; "Oh, should have done that 25 years ago". Maria: You may not plan it down to the fine detail, but you can start thinking in those lines. Rosslyn: And I'm hoping that I never will have to use those documents for my son, but it gives me a bit of peace of mind that I've got them in place. Bill: It gives families a big amount of confidence when you're asking them to make decisions when they've actually had any sort of discussion with their loved ones. Michelle: If you start planning, that means that the people that are with you with this journey don't have to make those plans for you. Rosslyn: It is to be remembered though that while you are able to answer, even if it's with the squeeze of a hand or the blink of an eye, you will always be asked what it is that you want. Sandy: And you've actually got the benefit of time to plan a lot of the hard stuff. Linh: And there's no right time, but I think the earlier the better. Watch the Starting the conversation video which gives practical advice on how to go about starting the conversation. to encourage health professionals to have open conversations about death and dying with their patients and their families and carers. Watch: Are you talking about dying? Watch: Good death, bad death, what's the difference? 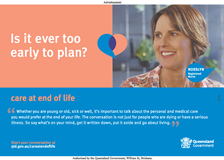 To find out how you can be involved and order resources please contact the Care at the End of Life project team at CareAtEOL@health.qld.gov.au. Read more about care at the end of life.